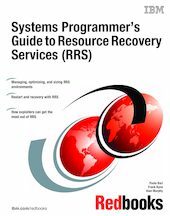 This IBM Redbooks publication gives you a broad understanding of the Resource Recovery Services (RRS) environment. RRS provides a global syncpoint manager that any resource manager on z/OS can exploit. It enables transactions to update protected resources managed by many resource managers. RRS is increasingly becoming a prerequisite for new resource managers, and for new capabilities in existing resource managers. Rather than having to implement their own two-phase commit protocol, these products can use the support provided by RRS. Since older transaction managers like CICS already offered many of the benefits of RRS for processing their own data, not many people rushed to exploit RRS when it was first introduced. However, as more transaction managers have become RRS resource managers, and as the complexity of the exchanges of transactional data increases, more and more systems and application programmers will need to use RRS. This book provides information that will help you install, tailor, and manage the RRS environment. It covers RRS exploiters, helping you to understand the connections between RRS and its exploiters, how they work together, and how the installation should behave in recovery/restart situations.